Jon Cooper has led the Lightning to a 301-157-44 record and a .643 points percentage in just more than six seasons behind the Bolts bench. TAMPA BAY – The Tampa Bay Lightning have signed head coach Jon Cooper to a multi-year contract extension Tuesday, vice president and general manager Julien BriseBois announced. Cooper was named the eighth head coach in franchise history on March 25, 2013 (six years ago yesterday) and is currently the NHL’s longest tenured coach. He is the franchise’s all-time leader for wins with 301.
Cooper, a native of Prince George, British Columbia, has led the Lightning to a 301-157-44 record and a .643 points percentage in just more than six seasons behind the Bolts bench. Dating back to his first full season in 2013-14, no other team has more wins (297) or standings points (635) than Tampa Bay. The Lightning have also scored more goals (1,535) during that time than any other team and own the fourth-best power play (21.3 percent). The Cooper-led Bolts have eclipsed the 50-win plateau on three occasions during his tenure, including this season when the team claimed the organization’s first Presidents’ Trophy as the team with the best regular season record in the NHL. 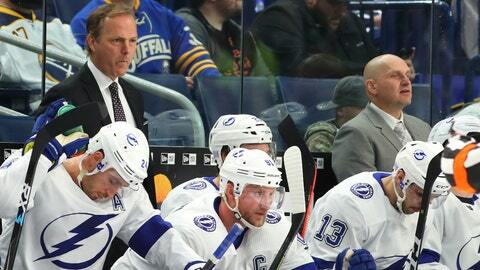 He was also named a finalist for the 2014 Jack Adams Award, given annually to the league’s top coach. On March 21, Cooper became the 49th head coach in NHL history to reach the 300-win milestone, joining Bruce Boudreau as the second head coach to have at least 300 career wins through 500 regular season games. His .643 career points percentage ranks tied for fourth all-time in league history among coaches with at least 100 games. The team’s success under Cooper has translated into the Stanley Cup Playoffs as well. The Lightning have played in the second most playoff games in the NHL since the 2014 postseason (PIT) and their 36 wins are tied for the second-most (PIT – 46, WSH – 36). In addition, the Bolts are the only team in the NHL to appear in three of the previous four conference finals. Prior to being named head coach of the Lightning, Cooper was awarded the Louis A.R. Pieri Memorial Award as the AHL’s top coach in 2012 after guiding the Admirals to the Calder Cup Championship. In two years in Norfolk he led the Admirals to a 94-44-18 regular season record and a 17-7 mark in the playoffs. In 2011-12, the Cooper-led Admirals set franchise records with 55 wins and 113 points en route to the organization’s first Championship. Along the way, Cooper and his team set a North American professional sports record, winning a remarkable 28 consecutive games. That season Norfolk earned the Macgregor Kilpatrick Trophy as the AHL’s regular season points champion, while also capturing the league’s East Division title.